Thank you for joining us once again for the Homebrew Happy Hour show! This is the podcast where we answer YOUR homebrew questions and we discuss all things related to craft beer! I love this time of the year. The weather is reasonably pleasant (i.e – not too hot or too cold for comfortable outside brewing! ), the flowers are blooming, and it’s the beginning of tradeshow season for the craft beer and homebrewing industries! As you already know, we’ll be in beautiful Providence, Rhode Island, at the end of June and we really do hope to see you there. This week is also a big week for the industry as it’s the annual Craft Brewers Conference in Denver, CO, which is where Todd happens to be right now! 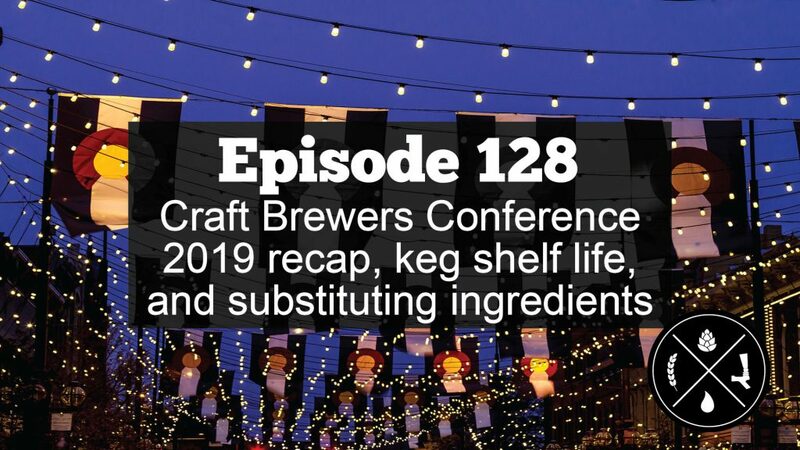 Todd (Kegconnection) calls in from Denver, Colorado to give James (CMBecker) and myself a recap of what he experienced during the Craft Brewers Conference. It’s hard work he does for our show but somebody has to do it… Also, James and I take YOUR questions on homebrew shelf life when your beer is kegged, and we also discuss what we do when we want to use specific ingredients but might have to substitute due to limited availability. We had a blast recording this week’s episode and hope you enjoy it as well. As always, If you have a question that you’d like us to discuss on a future episode, please click on the “Submit a Question” link at the top of our website or you can now call in your questions via our questions hotline @ 325-305-6107 and leave your message after the beep. This is a friendly reminder that, if we choose your question for a future episode, we give you a $25 gift card to that episode’s sponsor! Easy-peasy, right?